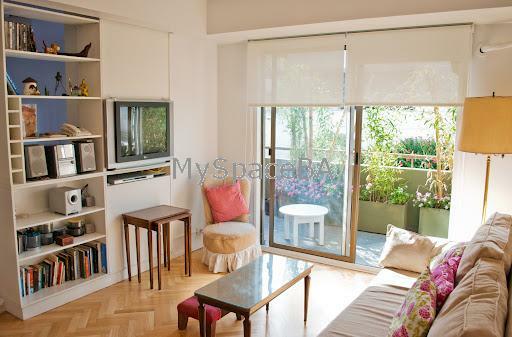 This is a cozy one bedroom apartment located just 200mtrs from the very well known Plaza Serrano in the Palermo Soho district, surrounded by pubs, coffee-shops, design shops and fabulous restaurants buzzing with nightlife. This apartment offers a bedroom with a queen size bed, a living area with sofa bed,windows with an exit to a lovely balcony, there is a fully equipped kitchen with a breakfast bar open to the living and a bathroom with shower . The flat is equipped with cable TV, Home Theather, DVD, plasma TV, Internet High Speed, Wi Fi, Landline telephone. Aircon, heating, fridge, dishes, kitchenware, linens and towels. Very good building, it is 5 years old and offers a backyard with an outdoor swimming pool and barbeque area. Doorman 24hs. Two elevators. Subway, Bus Stop, Zoo, Gym, College, Church, Pubs, Restaurants, Bars, Botanical Garden, Park, Square, NightLife area, Flea Market, Residential Area, Commercial Area, CyberCafe.